A clinical study of post-operative analgesia with dextral dexmedetomidine in children. Chinese Medical Doctors Association, China. Objective: To observe the viability, effectiveness and safety after infusion in child. Methods: Total 42 children patients were included into this study. The pain of patients was evaluated with FLACC and VAS. Moreover, the Ramesay grade method was used to evaluated anesthesia state, when the FALCC grade>4 or VAS grade>4, the morphine of 10 ug/kg was used by nurse anesthetist, the assessment was did per 10 min, after 1 h, we recorded the FALCC, VAS and Ramesay grades. Results: Within 1 h since the children went into PACU, there were no significant difference about FLACC, VAS and Ramesay score between two groups, so did the heart rate and blood pressure and the dose of morphine before drug infusion. Within 24 h during infusion, the heart rate, systolic and diastolic blood pressures were measured and performed statistics; the intra-individual variability results showed that there was no statistically significant difference about time factor, suggesting the indicators didn’t change over time. The interindividual variability results showed that P<0.05, suggesting the indicators were different as different grouping. And there was no significant difference about the interaction between time and grouping, indicating that the grouping factor didn’t change over time. 24 h after infusion, the VAS, FLACC and Ramesay score of patients were measured and performed statistics, the results showed that there was no significant difference about time and grouping factors; at the same time, the usage of morphine was recorded, the results showed that there was significant difference about the usage of morphine between the two groups from the second hour after infusion. Conclusion: Intravenous continuous infusion of dextral dexmedetomidine as adjuvant analgesia could reduce the demand of morphine effectively in children, which had good sedative effect and high safety. Dextral dexmedetomidine, Children, Surgery, Postoperative analgesia. The opioid drug by Intravenous infusion with patient controlled intravenous analgesia is a common analgesia method after surgery. However, this method will lead to some severe complications, including respiratory depression. Right-handed beauty pyrimidine can reduce opioid use during surgery and no respiratory depression. At present, some studies proved that right-handed beauty pyrimidine can reduce opioid use. Yet right-handed beauty pyrimidine study in child inadequate. In this study, we observed the viability, effectiveness and safety after infusion in child. Total 42 children patient included 22 male and 20 female who underwent abdominal operation with trachea cannula under the general anesthesia in our hospital, 1-6 years, ASAI-II grade. All patients have a good ventilatory and circulatory function and returned to normal bed-ward after surgery. Exclusion criteria: More than ASAI II grade, have liver and kidney and cardiovascular system diseases, returned to ICU after surgery. Before surgery, Nurse Anesthetist told the patriarch and/or children patient method and advantages and disadvantages, and how to use VAS grade and PCA. All patients underwent intubation anesthesia. After entered the operation room, the all patients were used with regular monitor, monitored and recorded the pulse oxygen saturation, non-invasive blood pressure and electrocardiogram. propofol 2-3 mg/ kg, fentanyl 1-2 ug/kg, Rocuronium bromide 0.6-0.9 mg/ kg were used. Seven fluorine fan inhalation was used to maintained anesthesia, meanwhile, the fentanyl or muscle relaxant was used to maintained hemodynamic stability du ring surgery. Based on ETCO2, we modulated the respiration parameter. After surgery, all children patients were returned to recovery room. In recovery room, the all patients were used with regular monitor, monitored and recorded the pulse oxygen saturation, non-invasive blood pressure and electro cardiogram. The pain of patients was evaluated with FLACC (Table 1) and VA S (Table 2). Moreover, the Ramesay grade method (Table 3) was used to evaluated anesthesia state, when the FALCC grade>4 or VAS grade>4, the m orphine of 10 ug/kg was used by nurse anesthetist, the assessment was did per 10 min, after 1 h, we recored the FALCC, VAS and Ramesay grades. After entered into surgery room 1 h, the following method was used. D group: Right-handed beauty pyrimidine of 0.5 ug/kg was added to 20 ml norm al saline and infused to patients within 10 min, then link to PCA. M group: 2 0 ml normal saline was infused within 10 min and then link to PCA. PCA in D group: PCAD: Right-handed beauty pyrimidine 25 ug/kg+normal saline 100 ml, the mixed liquor was infusion with 1 ml/h. PCAM: morphine 1 mg/ kg+normal saline 100 ml was infusion with 1 ml/time, lock time interval of 10 min. PCA in M group: PCAS: Normal saline 100 ml was infused with 1 ml/h. PCAM: Morphine 1 mg/kg+normal saline 100 ml was infused with 1 ml/time, lock time interval of 10 min. After drug infusion, we also used the FLACC and VAS grade methods to evaluated the pain grade and used the Ramesay to evaluate the sedation level. Th e PCAB method was used when FLACC or VAS grade more than 4. After the durg infusion 1 h, the children patients were returned to bed-wart and then the controlled intravenous analgesia mode was used. After returned to bed-ward, the nurse anesthetist evaluated the pain grade within 24 h, including heart rate, Heart rhythm, blood pressure and pulse oxygen saturation, FLACC, VAS and Ramesay grade, morphine usage and all kinds untoward effect, including urinary retention, constipation, skin itching and vomiting. The statistical analysis was used SPSS 16.0 software, measurement data was used with x ± s, the comparison between groups was used ANOVA, enumeration data was used χ2 test, there was a significantly differences when P value was more than 0.05. During 24 h follow-up after surgery, two patients quitted from the experiment: one patient had serious nausea and vomit in morphine group, stopped using analgesia pump and chose other analgesia; one patient had higher sedation score than expectation, whose parents chose the conventional automatic continuous infusion mode as analgesia pump. The two cases were not included in the statistical data. There were no significant difference about the age, weight and gender composition between the two groups (Table 4). Within 1 h since the children went into PACU, there were no significant difference about FLACC, VAS and Ramesay score between two groups (Table 5), so did the heart rate and blood pressure (Figures 1-3) and the dose of morphine before drug infusion. Figure 1. The heart rate between two groups. Figure 2. The systolic blood pressure (mm Hg) between two groups. Within 24 h during infusion, the heart rate, systolic and diastolic blood pressures were measured and performed statistics; the intra-individual variability results showed that there was no statistically significant difference about time factor, suggesting the indicators didn’t change over time. The Inter-individual variability results showed that P<0.05, suggesting the indicators were different as different grouping. And there was no significant difference about the interaction between time and grouping, indicating that the grouping factor didn’t change over time (Figures 4-6). 24 h after infusion, the VAS, FLACC and Ramesay score of patients were measured and performed statistics, the results showed that there was no significant difference about time and grouping factors (Table 6); at the same time, the usage of morphine was recorded, the results showed that there was significant difference about the usage of morphine between the two groups from the second hour after infusion (Figure 7). 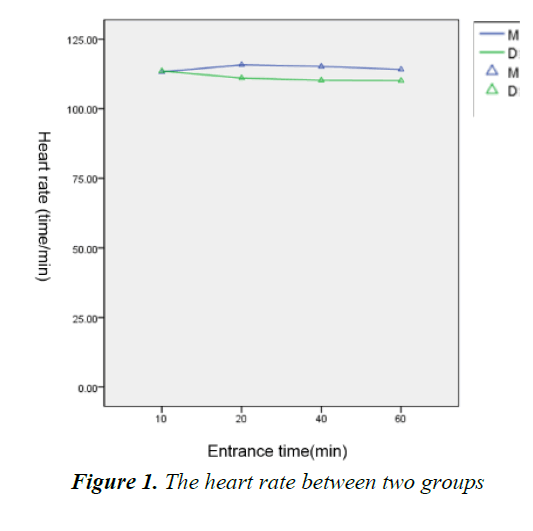 Figure 4.The heart rate between two groups. 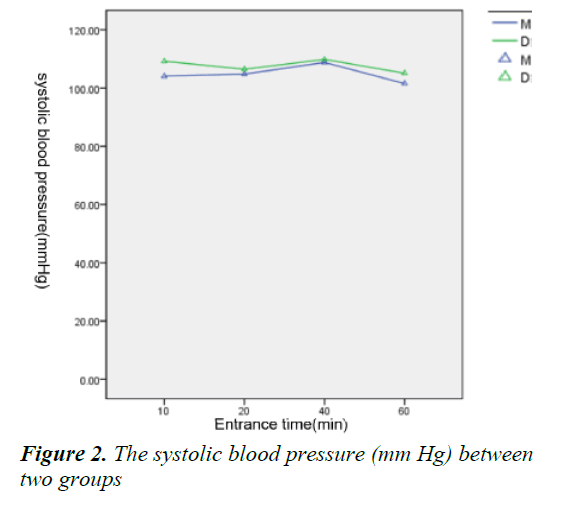 Figure 5.The systolic blood pressure (mm Hg) between two groups. 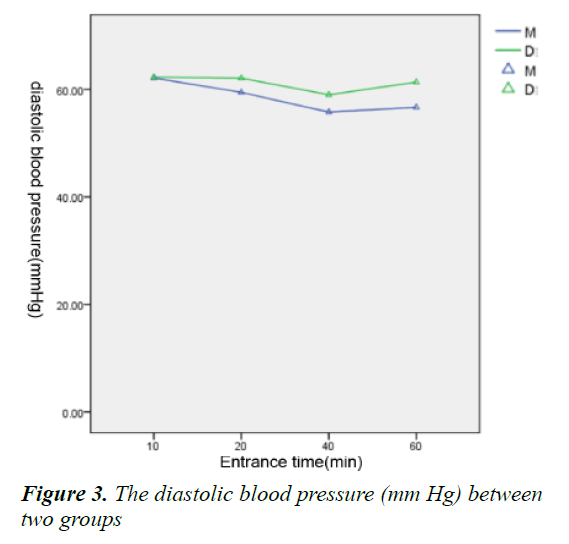 Figure 6.The diastolic blood pressure (mm Hg) between two groups. 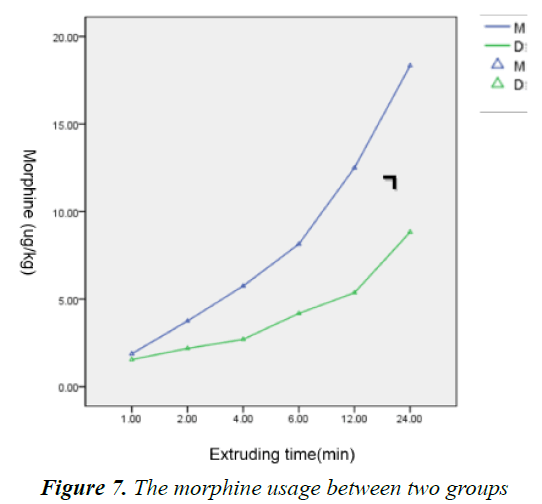 Figure 7.The morphine usage between two groups. In recent years, awareness of pain was constantly updated by pediatrician and the adverse consequences of pain have been recognized and paid attention, some advanced international medical institutions have made pain as one of vital signs observed daily. As the psychological and physiological were different between children and adults, the route of administration and drug selection were special postoperative analgesia, currently, the infusion of opioids with patient/parent-controlled venous analgetic pump (PCA) was the most commonly methods of postoperative analgesia in children, which has obtained good outcome. The contradictions of drug overdose and insufficient analgesia have always been paid attention during postoperative analgesia. In our study, one child’s parent of group dextral dexmedetomidine was unwilling to use PCA pump because they worried about the narcotic drug, which leaded to the unsatisfactory analgesic sedative effect; therefore, this patient dropped out the experiment. In group morphine, one patient also quit the experiment as significant nausea and vomiting and unwilling to continue to use the PCA pump. The above phenomenon was the unsatisfactory results for children with continuous intravenous infusion of opioids: insufficient analgesia and gastrointestinal reaction. The purpose of this study is to deal with the perioperative pain in order to achieve optimal analgesia and minimal adverse reaction for children. In this study, we combined dextral dexmedetomidine and morphine in PCA analgesia after abdominal surgery in children, to observe the security and effectiveness postoperative analgesia compared with usage of morphine alone. The dextral dexmedetomidine is a short-acting highly selective α2 receptor agonists (α1:α2=1:1620), which was approved for sedation of patients with endotracheal intubation mechanically ventilation in the United States in 1999 and has effects of sedation, analgesia, anti-anxiety and sympathetic blockade . The dextral dexmedetomidine could induce moderate to deep sedation and be awakened and no respiratory depression; therefore, it is widely used in perioperative period. The sedative and anxiolytic effects of dextral dexmedetomidine have been confirmed in children . Lots of clinical studies have accumulated the experience of continuous infusion in children, compared with adults, the requirement of opioids was also reduced and the hemodynamic was stable in children [3-5]; however, the related research about continues infusion of dextral dexmedetomidine is still limited. Our results showed that the requirements of morphine was significantly decreased in group dextral dexmedetomidine, the decrease of morphine reached nearly 50% at 24 h (18.1 ± 4.0*10 μg/kg vs. 8.9 ± 5.6*10 μg/kg), and the sedative effect was almost the same, which was consistent with other studies [6,7]. The results suggested that continuous infusion of dextral dexmedetomidine had good sedative effect, the reason was that dextral dexmedetomidine interacted with presynaptic membrane α2 receptor to inhibit the release of norepinephrine and terminate the pain signals; and then acted on α2 receptor of spinal cord to produce sedation, reduce stress, anxiety and other effects; all these effects were synergistic with opioids to enhance the sedative effect. It has been demonstrated that the use of dextral dexmedetomidine could reduce the demand for narcotic drugs [8,9]. Since dextral dexmedetomidine directly stimulated the α2 receptor of peripheral vascular smooth muscle to cause vasoconstriction, the patients could appear transient high blood pressure and slow heart rate during injection; while the dextral dexmedetomidine inhibit sympathetic activity, the heart rate and blood pressure of patients would decrease during infusion period . In this study, compared with the patients with morphine alone, the patients with dextral dexmedetomidine didn’t show significant changes in heart rate and blood pressure, suggesting a small dose and slow infusion of dextral dexmedetomidine could avoid dramatic fluctuations in blood pressure, which was accordance with the pharmacological characteristics of dextral dexmedetomidine . On the other hand, the heart rate and blood pressure were lower in group dextral dexmedetomidine than that in group morphine, but there was no significant difference between pre-operation and post-operation; and there was no bradycardia, conduction block arrhythmias, no other complaints. The results suggested that small-dose and continuous infusion of dextral dexmedetomidine (<24 h) had more obvious influence on cardiovascular system than morphine, but it still maintained hemodynamic stability. However, the children with cardiovascular disease or cardiovascular dysfunction (such as hypovolemia, cardiac insufficiency, heart conduction block, etc.) should avoid using dextral dexmedetomidine for analgesia, the security still needs verification. One case quit the experiment in both the two groups, in addition to parental assessment of pain, improper understanding of narcotic drugs and the adverse reactions in children; we also need to optimize the therapeutic regimen, in order to make a more simple and likely to be accepted regimen by parents. In summary, intravenous continuous infusion of dextral dexmedetomidine as adjuvant analgesia could reduce the demand of morphine effectively in children, which had good sedative effect and high safety. Bhana NL, Goa KL, McClellan KJ. Dexmedetomidine. Drugs 2000; 59: 263-268. Tobias JD, Berkenbosch JW. Initial experience with experience with dexmedetomidine in paediatric-aged patients. Paeditr Anaesth 2002; 12: 171-175. Tobias JD, Berkenbosch JW. Sedation during mechanical ventilation in infants and children: Dexmedetomidine versus midazolam. South Med J 2004; 97: 451-454. Enomoto Y, Kudo T, Saito T, et al. Prolonged use of dexmedetomidine in an infant with respiratory failure following liver donor liver transplantation. Pediatr Anesth 2006; 16: 1285-1288. Arain SR, Ruehlow RM, Uhrich TD, et al. The efficacy of dexmedetomidine versus morphine for post-operative analgesia after major inpatient surgery. Anesth Analg 2004; 98: 153-158. Lin TF, Yeh YL, Lin FS, et al. Effect of combining dexmedetomidine and morphine for intravenous patient-controlled analgesia. Br J Anaesthesia 2009; 102: 117-122. Sadhasivam S, Boat A, Mahmoud M. Comparison of patient-controlled analgesia with and without dexmedetomidine following spine in children. J Clin Anesthesia 2009; 21: 493-501. YildizM, Tavlan A, Tuncer S, et al. Effect of dexmedetomidine on haemodynamic responses to laryngoscopy and intubation: Perioperative haemodynamics and anaesthetic requirements. Drugs RD 2006; 7: 43-52. Angst MS, Ramaswamy B, Davies MF, et al. Comparative analgesic and mental effects of increasing plasma concentrations of dexmedetomidine and alfentanil in humans. Anesthesiology 2004; 101: 744-752. Khan ZP, Ferguson CN, Jones RM. Alpha-2 and imidazoline receptor agonists: Their pharmacology and therapeutic role. Anesthesia 1999; 54: 146-165. Tobias JS. Dexmedetomidine to treat opioid withdrawal in infants following prolonged sedation in the pediatric ICU. J Opioid Manag 2006, 2: 201-205.